The oil business just isn't as profitable as it used to be. ExxonMobil Corporation (NYSE:XOM) seems like it should be one of the best dividend stocks on the market. The company makes a commodity that isn't going to be replaced anytime soon and is one of the biggest names in energy today. But peek under the hood of ExxonMobil's business and the picture gets dark pretty quickly. Oil's future is in question, the company isn't investing in its own production, and the dividend payout ratio is already at a troubling level. Here's why investors should be concerned about ExxonMobil's dividend in the long term. It's tough to argue that the oil business is a long-term growth business long-term in 2017. 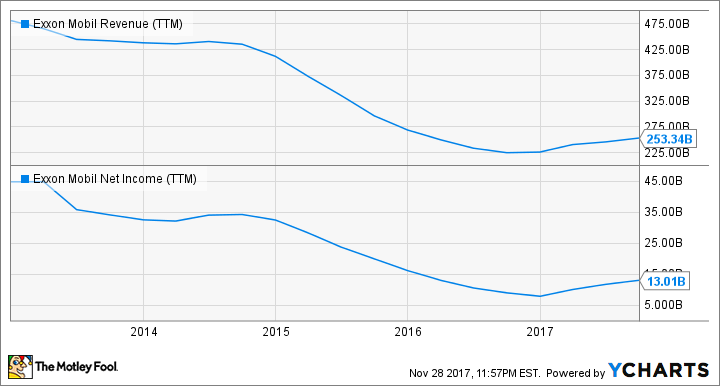 The chart below shows that ExxonMobil's revenue and net income are both in decline over the past five years -- largely because of falling oil prices -- and the future doesn't look much better. XOM Revenue (TTM) data by YCharts. Electric vehicles (EVs) are beginning to be viable for millions of auto consumers and automakers are planning a massive expansion in their EV fleets. According to the International Energy Agency, 2 million electric vehicles were on the road at the end of 2016. The International Energy Agency's (IEA) optimistic view of EVs has over 20 million EVs on the road in 2020 and over 200 million in 2030. Even the bearish view estimates that nearly 60 million EVs will be on the road in 2030. No matter how you look at it, EVs will be a sizable chunk of the vehicles on the road, which stands at 1.3 billion vehicles today. Each vehicle built with batteries rather than an internal combustion engine is a vehicle that's replacing a source of oil and gasoline demand. Since oil is priced at the margin (meaning the last barrel produced is really what determines price), that'll put pressure on oil prices, revenue, and earnings at ExxonMobil. Another flaw in ExxonMobil right now is that the company has been investing less in its own assets for years now. 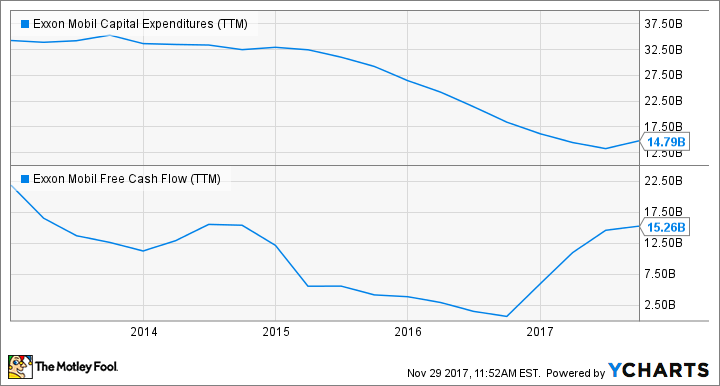 You can see below that capital expenditures are less than half of what they were five years ago, and without the reduction in spending, free cash flow would be underwater. XOM Capital Expenditures (TTM) data by YCharts. The oil and natural gas business are all about replacing production with new reserves, which requires investment in capital expenses. And ExxonMobil isn't doing that right now. Between the end of 2015 and the end of 2016 proved reserves dropped 19.3% to 19.97 billion barrels, driven by falling oil prices and the drop in investment. Eventually, the well will run dry and ExxonMobil will shrink simply because it isn't investing in projects that will generate returns in the future. I've mentioned some flaws in ExxonMobil's business, but the chart below shows that its dividend is already on thin ice. Companies want to be generating more free cash flow than they pay out in dividends, and over the last three years, ExxonMobil hasn't done that. The result is using debt to fund the dividend, which increases long-term risk for investors. 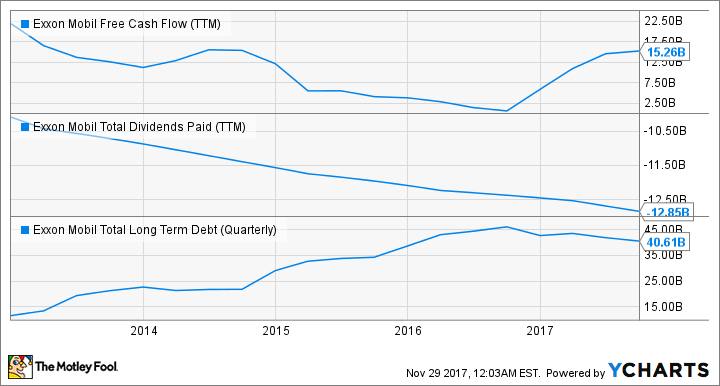 XOM Free Cash Flow (TTM) data by YCharts. Borrowing to keep the dividend afloat may be a reasonable idea if the future looked bright for ExxonMobil, but it doesn't. Fossil fuels are being disrupted by renewable energy and EVs and that makes this a tough dividend to bet on today. I'm so confident that ExxonMobil will underperform the market that I'm giving it an underperform call on My CAPS page.